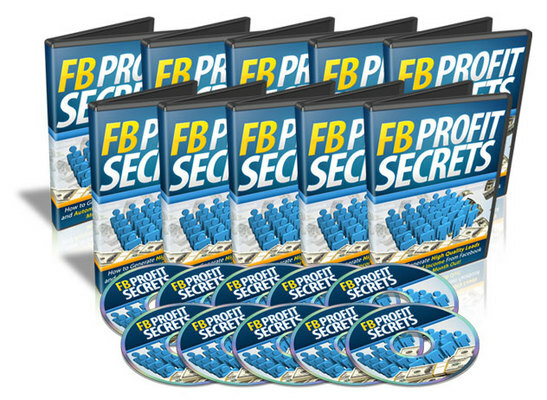 How to Generate High Quality Leads and Automated Income From Facebook - Month In, Month Out! It doesnt matter whether youre already on Facebook, youre new or simply want to start all over again. And as we have recorded every detail step-by-step, its like watching over my shoulder as I show you how to turn a free web 2.0 site into a cash-launching cannon from home! * VIDEO #1: How To Set Up Your Facebook Account - 01:43 - This video helps to get you started on Facebook by showing you how to set up a new account. * VIDEO #2: How To Create A Facebook Fan Page - 01:48 - Facebook fan pages have been used by many savvy online marketers to make a lot of money. This video shows you how to set up a fan page for your business. * VIDEO #3: How To Optimize Your Facebook Fan Page - 06:51 - (This video shows you some easy tips and tricks to make money with your Facebook fan page without spending any money at all. * VIDEO #4: How To Make Money With Facebook Fan Page - 03:02 - Facebook groups (different from fan pages) can be used as a great marketing tool because they allow you to send mass emails to the group members for free. This video shows you how to create and use your Facebook group. * VIDEO #5: How To Build An Email List With Your Fan Page - 02:38 - A large mailing list can be a great marketing tool. This video shows you how to build your mailing list by increasing the number of members in your Facebook group. * VIDEO #6: How To Create A Facebook Group - 02:38 - Facebook advertising allows you to easily create and show ads to millions of Facebook users. This video shows you how to take advantage of this effective marketing tool. * VIDEO #7: How To Grow Your Facebook Group - 07:47 - Before you starting spending money on Facebook ads, you need to know who your potential customers are. Use these market research tips to figure out the demographic of the customers that you should be targeting. * VIDEO #8: How To Set Up Your Own Facebook Ads - 03:17 - By creating effective ads, you increase the likelihood that customers will click on them. This video shows you how to make ads that will increase the number of clicks you get. * VIDEO #9: How To Optimize Your Facebook Ads - 02:46 - Facebook has to approve each ad before running it. Find out how to make sure that your ads are approved. * VIDEO #10: Facebook Ads Control Panel - 01:45 - This video shows you how to start, stop, edit, copy, manage, and organize your ads. It will also show you how to change the way you pay for your ads (per click or per impression).